July will be here before we know it but there are still a few important things happening in Webkinz this month. Before July begins, remember to enter the Webkinz Community Codes that expire on Saturday, June 30th if you haven’t entered them yet. Summer Sensation will be on Thursday, June 28th. 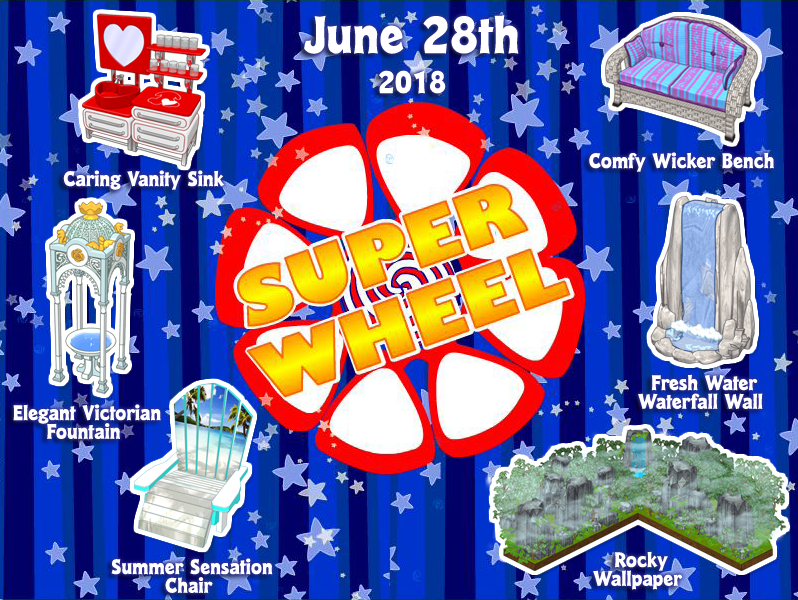 Players will be able to log in on the Webkinz mobile app or the website to receive a Summer Sensation gift, but the Super Wheel will only be available on the website. If you want to see the Summer Sensation gift before Thursday, you can see a spoiler of it. The 2018 Berry Fest also ends on Thursday, June 28th, so be sure to complete the Jumbleberry Fields Trophy Challenge on or before Thursday if you want the prizes. Please note the prizes (a Jumbleberry Fields Trophy and a Moonberry Gift Basket) from completing the challenge are not new, though. Wacky Weekend will also run from Friday, June 29th to Sunday, July 1st. Players will receive one Wacky themed clothing prize each time they score more than 11,500 points playing WackyER Zingoz in the arcade (web only – not available on the mobile app). The clothing prizes for scoring more than 11,500 points are the Wacky Tuxedo Jacket, Wacky Tuxedo Pants, Wacky Ballroom Gown, and the Wacky Ballroom Shoes. These items are also listed above and are not new items. Which event are you looking forward to the most for the rest of June? Do you enter community codes at the start of each month, as the month goes on, or at the end of the month? Are you looking forward to Summer Sensation? Did you complete the Jumbleberry Fields Trophy Challenge or will you try to complete it, if you want the prizes from it? Are you going to try and play WackyER Zingoz? Boper, I’m looking forward to seeing your room designs! Muffin, it was great seeing you too, and thanks again for the trade! You should definitely consider making a wish list And hopefully that Mystery Item Box will be rereleased soon – I’m sure there are many who would love to have another chance at winning those rare prizes! Thanks for the new post, Patsie! The Summer Sensation gift is really pretty. And congratulations on winning the Selfie Booth and Slush Machine, bepsy! It’s almost dinnertime! We’re having homemade cheese pizza And yes, we’re three hours behind KinzTime, LOL Have a great night! Bepsy, congrats on winning the good prizes from the wheel. Is the slush machine a dispenser, or is it a decoration? All day rain expected today…. before the heat wave starts ! dee… congrats on your trifecta ! Do you win a boat load of cash for three consecutive first posts ??? Cheese .. homemade pizza sounds delicious ! shorty… the slush machine is a stove ! and the selfie machine is animated ! moms… All talk is… will he stay or will he go !! (LBJ)… took my nephew out to lunch and to get some summer reading books… non stop discussion on all of the draft picks and of coarse his opinion on potential scenarios for LBJ’s upcoming decision… he makes my head spin !! but we had a nice day. Polarberries continue to fly in WKN ! Anyone with Asian accounts.. Summer Sensation has begun.. Not so..Super Wheel and Summer painting.. THANK YOU GAGA for the Summer Sensation reminder!!! I’m going to gather my goodies on my Asian accounts now!!! Thanks for all the reminders about whats coming up on this post! Cheese – Yes, I will consider making a wish list. The only problem is I don’t even know how to begin! Moms, you might have to help me through the wish list process. I really only know how to comment, and I am clueless on how to make a trading post. Enjoy the last few days of berry fest! Hey Muffin – check out the Pages over on the upper right of the blog – there is one that says “How to Post Your Trading List” & let us know if you have any questions or problems!! !